It’s not very often that a game comes along that offers the player true and complete freedom. Many games offer the illusion, setting you loose in a large area and claiming you can do whatever, but slapping you with rigid repercussions and a narrow storyline to follow. Mount & Blade for the PC, ultimately, fell just short of managing to offer the player complete freedom. It does, however, come much closer than any other game I’ve played in a long time. Set in medieval times, the character plays as the leader of a mercenary company working independently in a nation where many kings are vying for power. You are free in the sense that there is no defined goal except to advance – you may align yourself with whatever king you like, do whatever missions you like, and basically set about living your life the way you see fit. You can make a living buying and selling goods between towns, hiring your services out to guild masters and village elders, hunting down bandits for bounty, or offering your services to one of the many kings and hopefully gaining enough favor to be granted your own fief – that is, your own town or castle to manage. There are, however, a few things that are notably missing from the game. For example, in one of my play throughs I attempted to make a name for myself by conquering as many cities, towns, and castles as I could without swearing my allegiance to any king. However, I discovered that the existing status quo doesn’t take kindly to upstart warlords trying to start their own kingdoms, and I ended up at war with everybody. Since I had neither the resources nor the armies to defend an entire kingdom, I was pretty much forced to offer my loyalty to one of the existing kings just to get the attacks to stop. Admittedly, the game is still immensely enjoyable even if you’re not trying to conquer every city on the planet yourself. I found that working for a king was a lot of fun – especially once he decided to get all of his armies together and go on a massive campaign through enemy territory, taking everything that stood in his way. Most of the time he requested my help with the campaign, and so I found myself on countless battlefields, where the other major aspect of the game kicks in – tactics and combat. When you engage in battle, a portion of your army (how many depends on the difficulty and other settings) takes the field with you. They’ll automatically charge down enemy troops, which is fine if you outnumber them. But often times you’ll be facing a superior foe, and will want to use battlefield commands to succeed. Once you begin ordering advanced maneuvers, you’ll find that more and more battles start going your way. For example, outnumbered by lots of weak infantry? Have archers stand on a hill where they can pick off enemy troops as they advance. Stick your infantry in front of the archers to protect them, and then when the enemy is right on top of you, have cavalry charge in from the sides. In addition to being an able tactician, you’re also a formidable warrior yourself. Although combat isn’t flashy or even very complex at all, it’s simple enough to get the hang of and you’ll often find yourself doing the most damage to the enemy out of any soldier in your army. You can blame some of that on underdeveloped AI if you’d like – and indeed, there are times where I was wondering if the soldiers were blind for all the stupid mistakes they were making. But you’ll still find most battles enough of a challenge to keep you occupied. 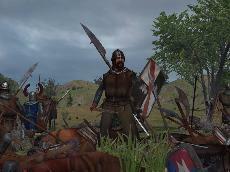 Mount & Blade may not offer you perfect freedom, but it still comes closer than most games, and it does offer solid entertainment with a multitude of options that are open to you.